Congratulations to our 2011 PATH Intl. Conference scholarship winners! Robert Putnam's ground-breaking research in his book Bowling Alone (Simon and Schuster, 2000) warned that the very fabric of our connections with each other has plummeted, resulting in impoverished lives and communities. An example of this phenomenon exists within PATH Intl. as out of the approximately 8,000 members, only a small percentage at any given time are active volunteers who directly influence the direction of the association. This finding, in collaboration with the forward thinking vision of the PATH Intl. Board of Trustees and staff has galvanized PATH Intl. to take a lead in creating a platform with processes that support the development of communities. The vision of the PATH Intl. Community Building Initiative is to identify and support the energy coming from the membership, creating a platform that feeds those efforts. The objectives of the community building initiative are to research concepts to provide all members with benefits and resources to improve their practice or business, to support their professional development and to enhance the ability of PATH Intl. to positively impact equine-assisted activities and therapies. PATH Intl. membership communities would identify and connect individuals with a shared interest and/or purpose. Connections could be knowledge or information based, socially motivated or advocacy-oriented. The communities might be designed to advance the development of knowledge in a particular field of interest or practice and contribute to the professional development of its members and the association as a whole. A work group of individuals representing the diversity of PATH Intl. professionals has come together to share their expertise in and passion for community building. Read more to learn about this exciting initiative and those individuals paving the way. You can see in the 2011 PATH International Conference and Annual Meeting registration book the great session line-up and you can also decide which networking events you would like to attend. Are you interested in fundraising for your center? You can attend "Fun Fundraising at Horse Show Time" to learn how to raise funds through a horse show. Perhaps you'd like a demonstration of Whoa-Ga!, which combines Iyengar yoga and centered riding concepts to improve balance and core strength. Learn about the effect of equine-facilitated psychotherapy on post-traumatic stress disorder in youth with a history of abuse. Whether you are new to the EAAT industry or have many years behind you, you will find something of interest in the Research, Program, Administrative and EFP/EFL tracks. Click here for the digital registration book or here for information on the conference. Time is running out for the early-bird registration discount! Register online by September 6 and save $150 off the on-site price. Click here to register. For those who took advantage of the promotional rate, session information is now available. There has been a large response to the conference, so we encourage you to make your selections as soon as possible to ensure you get into the sessions you want. To make your meal, special event and session selections visit the PATH Intl. website. Log in at the upper right hand corner using your email address and password. Once you have logged in, select "my account" and then select "my events." The "my events" page will list all events for which you are registered. Next to the annual conference you will see a link, "add sessions." Click on "add sessions" and you will be able to check each item you want to add to your current conference registration. The response to this year's conference has been tremendous! Hotel rooms are going quickly. If conference attendees want to stay at the conference site they can still book at the Hyatt for rooms with kings or kings with roll always. Call (859) 253-1234 or click here. Enter the code g-NARH into the corporate\group# field to apply our group rate. If this will not work, the adjacent Hilton Hotel will honor rooms at the same discounted rate of $125/per night plus tax while they last. Call (859) 231-9000 to make reservations. Be sure to mention you're with PATH International. Book your travel to the PATH International Conference and Annual Meeting through Delta Airlines and receive discounts on airfare. Domestic flights can be booked Nov. 4-15 (unfortunately, the discounts do not cover international flights). Email Bonnie Burgess, PATH Intl. 's travel agent, to book your travel and discuss discount options. Looking for a Roommate at Conference? 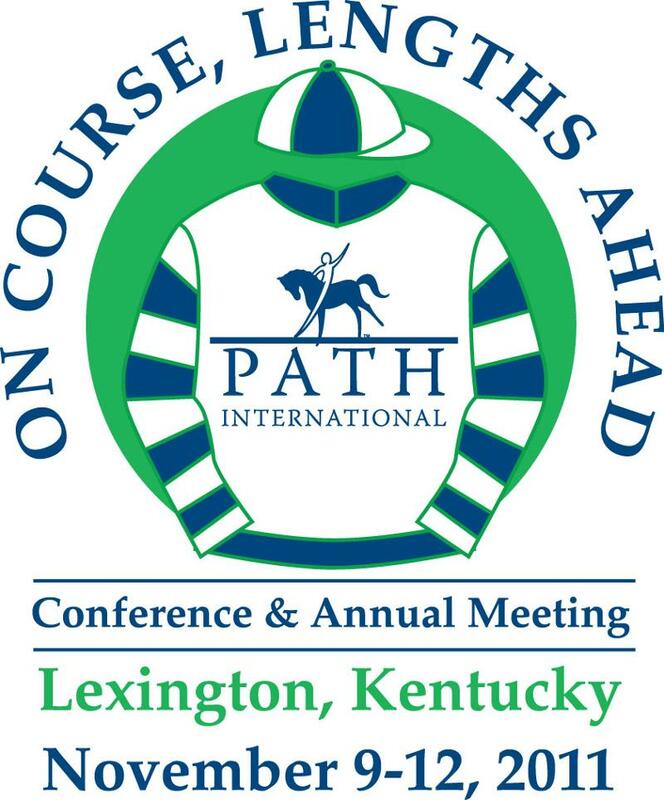 The hotel rooms for the 2011 PATH International Conference in Lexington, KY, are filling up quickly. If you would like to share a room, click here to see contact information of others who are looking for a roommate. You must be logged in to see this information. NOTE: PATH Intl. will not match you up with someone. If you would like to have your name and contact information added to the list, email Cher Smith. Region 5 would like to invite you to attend the PATH Intl. Region 5 conference, September 16-18, at the Calvin Center in Hampton, GA. Look for information to be available soon on the PATH Intl. regional conference page. The Equine Specialist for Mental Health and Learning certification is meant to certify an individual as the horse handler in any un-mounted mental health or learning session. Please visit the PATH Intl. website for an updated copy of the certification booklet and complete details on the requirements of the certification. Ever just need a question answered now about the health, management, care or well-being of your equine partners? Are you developing an educational curriculum for your summer camp or therapeutic programs and need some current ideas? Maybe you have been researching breeds of horses to find out which breed may be better suited for your program and the climate/environment in which you live and need more information. Online equine-related reference links are a quick way to research just about any topic, from lameness issues to how to saddle fit correctly to what types of grasses are best suited for and grow better in your local climate to how to recondition a horse after some time off. You may even be able to find suitable online equine-related magazines with dozens of educational articles and tips at no, or minimal, cost - and completely paperless! The links mentioned here are for informational purposes and as examples and only cover a smattering of the many reputable sites available to you online. Please remember, however, that if you are researching health-related questions online, there is no substitute for consultation with your veterinarian and/or farrier. You should never rely solely on information found online or in other publications to treat your horse for conditions that should be seen by a veterinarian. You may discover other sites in your search and can add them to your "favorites" list. If you are ever unsure of the reliability of a site in your search, contact your veterinarian or check with either the Better Business Bureau online or the Federal Trade Commission (FTC) Bureau of Consumer Protection online. Bayer Animal Health has just launched its "Legend of the Year" award for this year. This award honors veterinarians or vet techs who have done outstanding work for horses in need or unwanted horses. The vet receives a $5,000 donation to the equine charity, rescue or therapeutic riding facility of their choice. This could be a good way for one of our centers to receive a nice donation. In addition the person who nominates the vet will be entered to win an Equitrekking Adventure Trip to Mackinac Island and be on camera. Nominations will be accepted through October 15, 2011. You may have noticed that if you are using a bookmark to access the PATH Intl. website, it opens a page with the directory listings rather than the homepage of the website. This is due to an outdated bookmark. Simply change your bookmark to show www.pathintl.org instead of www.narha.org and everything should then display correctly. Unless otherwise noted, contact Abby Hendren at (800) 369-7433, ext. 104, with questions. All dates are subject to change. To register for an event, please contact the host site directly. You can locate their contact information under the Find a Center link on the PATH Intl. home page or on the PATH Intl. events calendar.